Being involved in a boat accident can be stressful for a variety of reasons. Not only are bodily issues a concern, but so are the damages that your boat incurred during the accident. At Anchor Marine Repair, we can’t help you with your personal injuries, but we surely can help with your boat repairs. 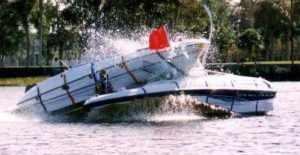 Rated as the best boat accident repair shop in Minneapolis, rest assured that your boat will be in great hands with our expert boat repair team. At Anchor Marine Repair, we understand that your boat may be your most prized possession. So, it makes sense that you don’t want just anyone working on your boat. Finding a trusted, experienced and affordable boat repair shop is something that you should definitely do if you haven’t already. If you’re in the Minneapolis area, keep the best boat accident repair shop, Anchor Marine Repair, as a contact in your phone for whenever you may need us in the future. With every boat that is dropped off to be repaired at our repair shop, it is handled with extreme care so that your boat is repaired to better than pre-accident condition. Don’t let the fear of the price tag be the reason that you forego getting your boat damage repaired. By choosing to partner with Anchor Marine Repair, you can take advantage of our complimentary boat accident repair estimate. This estimate will provide you with the realistic cost around your repairs. If you are not satisfied with our estimate, feel free to walk away with no questions asked by our staff. At Anchor Marine Repair, we take pride in being the best boat accident repair shop in Minneapolis, MN. Your boat will be handled with extreme care every step of the way. To request a free estimate on your boat repair needs, give our dedicated repair specialists a call at (763) 972-3540 or email service@anchormarinerepair.com. We’re confident that your boat will come back to you in better than pre-accident condition after our team repairs the damage on your boat.